People are gradually getting rid of the wide-spread Soviet stereotype that “it is bad to change work frequently.” Source: PhotoXpress. Experts say the Soviet-style labor market structure that implied long-term work for one employer has been left in the past. Currently, the labor mobility level in Russia exceeds the level in Europe. This trend, however, has both advantages and disadvantages for the economy. Russians change work more frequently than their European counterparts. According to Rosstat (Russia’s Federal Statistics Service), over 11 percent of the working population remains employed at a primary place of employment for less than a year only; for 700,000 employees, this period lasts less than a month. Experts interviewed by RBTH differ in their opinions on whether this trend is favorable for the economy or not. There is one advantage mentioned by experts: people are gradually getting rid of the wide-spread Soviet stereotype that “it is bad to change work frequently.” It was tradition in the Soviet Union to label people who were too particular about their workplace as “job-hoppers.” Such employees were subject to public condemnation and became subjects of caricatures; and the Communist Party, of course, tried to complicate their lives. “Russia is a country with a rather traditionalist lifestyle, and if a tendency is established it will last long. 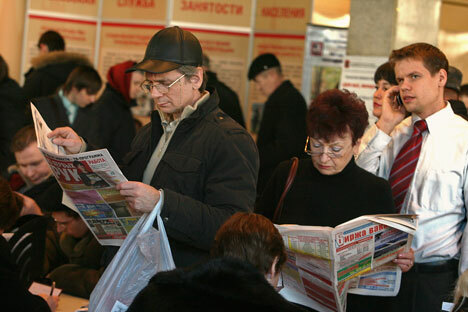 In general, it is not bad that Russians started to gradually get rid of the Soviet stereotypes and choose the work they like, and not the one imposed by the Party, government or any other authorities,” said sociologist Zakhar Gotovtsev. Experts find other positive factors in the labor mobility trend. Nikita Maslennikov, advisor for the Institute of Contemporary Development, links high labor mobility to the economic shift toward innovation technologies. “People try to change physically hard, standardized and underpaid work to more qualified intellectual labor, and this stimulates the development of industries creating higher value-added products,” Maslennikov said. According to the development expert, the labor force from agriculture, production and processing industries is shifting to service and high-tech spheres. Maslennikov considers this trend positive, but that estimation is debatable. “The labor market in the agriculture and production segments is extremely narrow now. Qualified specialists in these sectors are few, and they are in extreme demand,” said RBC analyst Timofey Shatskikh. According to him, good production specialists are not inclined to change jobs frequently, and labor migration is mainly characteristic of the service industry and creative professions. In addition, migration is often caused by low employee qualifications. “Only few academic institutions in Russia give profound knowledge in PR, and, as a result, there are few experienced specialists and many self-taught or just self-assured employees. For this reason, the situation when an employer makes the decision to dismiss a person – as he or she fails to meet the levels declared at the interview – is rather frequent. This is the reason for high personnel turnover,” said Shatskikh. The representatives of large production companies confirm that finding a skilled worker is much more difficult than finding a clerk, for example. Irina Makeeva, head of HR Department at Norilski Nikel, said: “Unlike technical specialists, there are many applicants with economic and legal education wishing to work for us. The competition for technical vacancies is rather low, and we use all options to attract such specialists.” There is practically no turnover of production employees in the company. In this context, the government’s initiative to cancel workbooks is worth mentioning. This is one more relic of the Soviet past: a special paper on which data regarding the employee’s length of service is recorded and submitted to an employer. Workbook procedures result in routine (and often senseless) bureaucratic paperwork on a national scale. If workbooks were terminated, many officials and HR specialists all over Russia would be relieved. However, this change could bring another problem: how would employers then verify the length of service declared by applicants at interviews? Would the cancellation of workbooks result in mass dishonesty and, consequently, a much higher personnel turnover? Experts expect that, if production and public service spheres had the same reputation-based criterion for selection of skilled specialists already in-use in the production industry, working conditions would considerably improve and, consequently, personnel turnover would practically stop. However, the number of unemployed persons would increase simultaneously. Thus, employees would face a choice: to work under attractive labor conditions with severe competition or to find less favorable jobs easily.